“House Freedom Caucus Chairman Mark Meadows is a man of unusual character and integrity in Washington, D.C. Most would bend to the whim of a newly elected President, and compromise core principles to give him an early win. But Mark Meadows understands that restoring our health care system to a free market orientation is too important to play politics over. “Representative Meadows gets it right when he says that any new health care law must lower costs for the average consumer and rid itself of Obamacare mandates. The Ryancare legislation fails both these key principles. “The people of the 11th District of North Carolina owe their Congressman a great debt of gratitude for standing firm, even as the President who he campaigned for so vigorously is pushing him to support the disastrous Ryancare legislation. Anyone else ready to stand up for the folks back home? There is only one NC Congressman named Mark with the courage to stand up for real conservative principles. Of course we knew that we the other Mark voted for Bohner for a cash handout. Careful. You may get a scolding from “Informed” Millennial about your scornful attitude toward “the other Mark”. But real conservatives in the 6th District have long known that they sent a squish to Washington. Can’t blame them the first time…..the alternative was Phil Berger, Jr…….but Walker had a real conservative challenging him last year. No excuse to keep sending this guy back. Thank you Mark for standing your ground! Persuade Trump to get on board. And Congressman Mark Walker, 6th District, Chairman of the Republican Study Committee, knuckled under when the Donald schmoozed him in the Oval Office! RyanCare should lose in the Senate unless he Democrats decide to vote for it and take a partial loaf instead of the whole loaf as they have now. The Communists are very good at taking a partial loaf! Beware Congressman Walker and Donald! I believe Walter Jones is a “No” as well. Ted Budd has also announced he is a NO vote on Ryancare, aka RINOcare, and Walter Jones has told constituents he is against it as written. Ryancare is almost as bad as Obamacare, so maybe we will have some more Congressmen stand up for their constituents. Ryan is selling us down the river on this and doublecrossing Trump. I also hope the president wakes up to what RINO Ryan is doing to us. Ryan is a sober Boehner. Personally, I cannot imagine the gall of a US House that proposes any Obamacare replacement that does not – as its primary function – reduce the overwhelming cost of premiums / deductibles / copays that have made O’care all but useless for the average family’s healthcare. 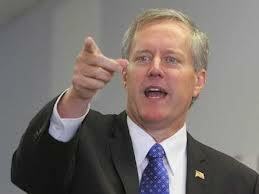 Stand firm, Rep. Meadows, stand firm! You are right on the money. Regular hard working folks are suffering under this horrible expensive health care mess we have now. It simply needs to be fixed and fixed right: no more BS, no more favors for friends and mutual scratching each others backs. Tweaking and twaddling ObamaCare into RINOcare ain’t cutting it. Now is well past time to do right for American citizens, for a change. That’s a change I can believe in. This is NOT ”repeal and replace”. It is putting lipstick on a pig and telling us it is not a pig. Ryan has done a number on President Trump on this issue. We will never see the reduction in healthcare costs without a free market. And we will never have a free market while Certificate of Need exists in NC. Yet another repeal bill has been filed, this time by the NC senate, where it will surely pass. The house is where the difficulty lies. The USDOJ has said time and again that these laws must be repealed to allow competition and to ultimately see the reduced costs and better quality service that people deserve. Our politicians need to stop servicing the lobbyists and do what is right for their constituents. Repeal CON. Well said. The crux of the biscuit in our health care disaster is the false health care market that has been created. We need a real market, a free market. This crooked a$$ system needs to come to an end. U.S. citizens have been abused for too long by these crooks. Anyone heard how Mr. Cut Cut Cut federal spending is voting?? Aka George Holding. You know the one everybody says is so conservative? Breaking news…..: It has been confirmed George Holding is a yes vote for Rino Care! Please tell me again how conservative George is? George has everyone duped and duped bad! I’m with Meadows and posted this to nearly 1,000 on facebook. Stand strong, you have our backing all the way.